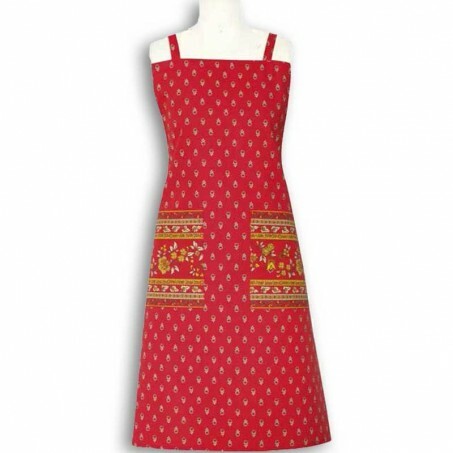 Made in Provence by Marat d'Avignon®, this red kitchen apron is designed to last. 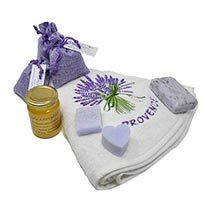 The cotton used for its manufacture is of superior quality, with good resistance colors. Indeed, the colors are bright. These are the ones most often found on Provençal cotton fabrics: mainly primary colors. The gray taupe only is very current next to the traditional colors. Note the length of the "skirt", well above average. Two large pockets sewn flat are a reminder of the Avignon stripe pattern and provide a very elegant floral decor. The apron is attached with straps on each side of the bodice, which meet on the upper back with a slide clasp system. This allows to adjust the height to the size of the cook or the chef. You will find in this page a link to the essential accessories of these women’s aprons with pockets: the gloves and pot holders. They are available in all colors of the Avignon collection quilted with an insulated lining. Do not forget them! The name of this collection refers to a very ancient city that was a papal city in the 14th and 15th centuries. Currently, it is the first city of the department of Vaucluse. It is crossed by the Rhone, on which throne the Bridge of Saint Bénezet, the famous Bridge of Avignon of the well known French song. The Cite des Papes preserved its old ramparts and the majestic Palais des Papes. It is now a UNESCO World Heritage Site. Its summer festival is one of the most popular and attracts many tourists each year. It needed such a reference to name the table linen of this divine collection!